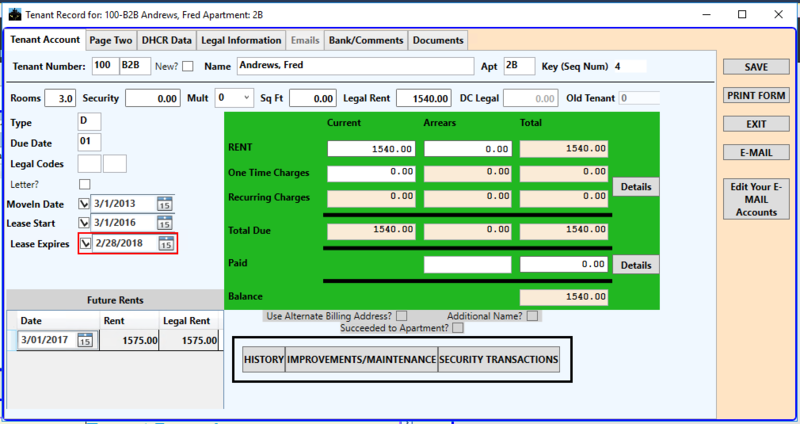 This screen shows a summary of a tenant's account as well as information about leases, and legal status. From here you can drill down into account, tenant, and unit details. The other tabs hint at the wide range of information stored for each tenant as well as two of the available add-on applications: Tenant Relationship Management (WinTRM) [Alerts], and Document Scanning and Management (WinDOC) [Documents]. These tabs are now empty since this is only a demo of WinPM. Also notice the 'Email Tab' and the 'E-MAIL' button. Emails can be sent directly to a tenant from this screen. Late Notices can also be sent via E-Mail.